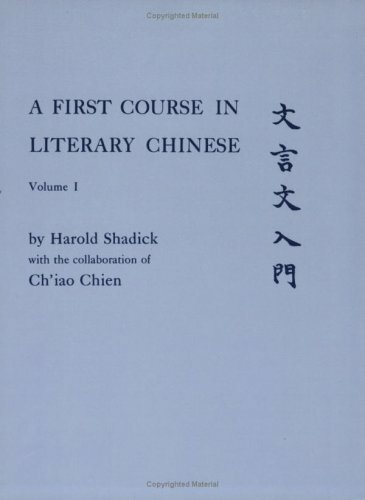 hundred Chinese characters, and understand simple passages of modern Chinese.The language studied in this book took shape in the latter half of the first millennium B.C. and persists as a living medium of expression today. Bernhard Karlgren has said of it: "All grammatical expedients which have been current at any time in the past, can be used promiscuously in the literature of later epochs. "Texts 1-22 in Volume I constitute the core of the course. With the accompanying Exercises (also in Volume I), they provide material for about forty class sessions, thus leaving time in a normal academic year to take up a selection from Texts 23-34 and the Additional Texts A-N. (All are included in Volume I.) Most of the first twenty-two texts are from classical works of the formative period when the basic syntax was established. The remaining texts illustrate later grammatical forms and contain subject matter of considerable variety.